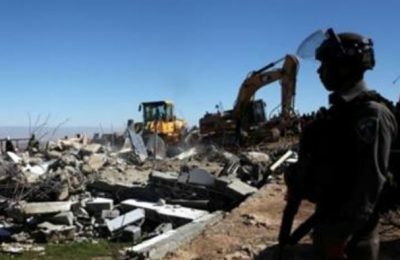 Israeli soldiers invaded, Sunday, Ya’bad town, in the northern West Bank governorate of Jenin, demolished five coal production plants, and illegally confiscated hundreds of tons of wood. Kayed Abu Bakr, the head of the coal-production workshop owners, said several Israeli military vehicles, including three bulldozers and five trucks, invaded the coal-mining area, in Ya’bad, and demolished five coal production plants. The demolished properties are owned by Mansour Mohammad Abu Bakr, Sobhi Hasan Zeid, Hafeth Rafiq Abu Bakr, Mansour Samih Abu Bakr and Bilal Ahmad ‘Abbadi. He added that the soldiers loaded hundreds of tons of woods into the military trucks, in addition to burning tons of wood. The official stated that Israeli colonialist settlers, illegally living on private Palestinian lands, constantly complain to the military about the coal mining and production, and the army repeatedly invades and destroys the plants. He also said that there are about 30 plants in the area, providing livelihood to more than 1000 families in Ya’bad, and many nearby Palestinian communities. Nearly a month ago, the army demolished eight coal production plants, and uprooted dozens of trees, leading to significant financial losses.